Asymmetric Multiprocessing: RPMsg device and driver on Linux and Android. A crucial component for Inter-core communication in an Asymmetric Architecture is the RPMsg device. The RPMsg char driver exposes RPMsg endpoints to user-space processes. Multiple user-space applications can use one RPMsg channel uniquely by requesting different interactions with the remote service. The RPMSg char driver supports the creation of multiple endpoints for each RPMsg device, enabling the use of the same channel for different purposes. Each created endpoint device shows up as a single character device in /dev and access rights can be set independently for each individual endpoint; this holds for a Linux or Android kernel patched with the support for RPMsg. 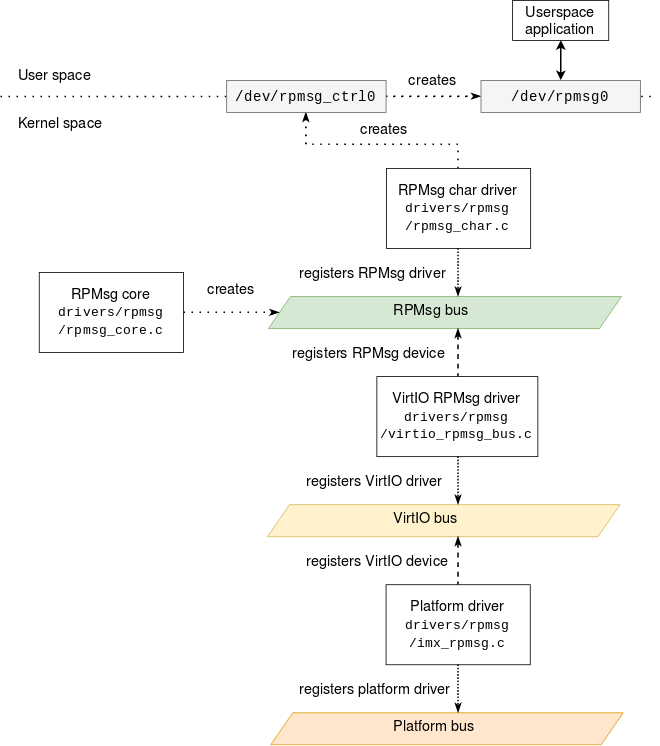 The following image shows the current Linux implementation of the RPMsg framework and the RPMsg char driver functionalities. Note: in this example only one endpoint is exposed. The driver was first introduced in the Linux 4.11 version, and sources can be found in the $(KERNEL_SRC)/drivers/rpmsg folder of mainline kernel (v4.6 at the time of writing). The implementation is based on prior art by Texas Instruments, Google, and PetaLogix and was derived from a FreeRTOS performance statistics driver written by Michal Simek. The three fields are used by the RPMsg backend to create the actual endpoint and by the RPMsg char driver to create a RPMsg endpoint device (under /dev/rpmsgX), along with the same three parameters in sysfs for udev usage. Multiple endpoints can be created using the control interface. Each created endpoint device is assigned a sequential number, to be distinguishable among each other. For each endpoint, the RPMsg char driver uses a socket buffer queue to hold the data received on the channel destined to that endpoint. When data from the remote device arrives on the RPMsg channel, the RPMsg char driver allocates a socket buffer to hold the received data and enqueues it in the destination endpoint socket buffer queue. read: when a read operation is requested on an endpoint device, the backend dequeues a socket buffer from the socket buffer queue associated to that endpoint (if not empty) and copies data to the user's buffer. write: when a write operation is requested on an endpoint device, the backend copies the user's buffer to a kernel buffer and sends an RPMsg message with the buffer content to the remote device. The rpmsg endpoint will be created and destroyed following the opening and closing of the endpoint device, allowing rpmsg backends to open and close the physical channel, where supported.